They say the Blue Ridge Mountains are so high that you can see as far as three seasons from their peaks. When conditions are right, those very peaks can be plunged into full Winter snow even as the mountainsides are burning Autumn oranges and the valleys below still bursting with the green of the waning Summer. There’s no doubt that while a cruise along the mostly 35 mph Blue Ridge Parkway would be beautiful any time of year, weaving in and out of it’s ups, downs, twists and turns is stunningly spectacular when the leaves are changing colors, which unlike the quick bursts that Fall tends to be in the northeast, this stretch of the Appalachians blazes neon hues of Crayola yellows, oranges and reds sometimes for as long as a full month, with a few earlycomers or late leavers on either end of October signaling early what’s to come, or to anyone arriving too late, what they’ve missed. This is an all seasons road, though, make no mistake. From blue skies and lush greens of the warmer months, mountain flowers violet and yellow in bloom all Spring long, and even coated in thick white snow, the Blue Ridge Parkway is a wonderland. 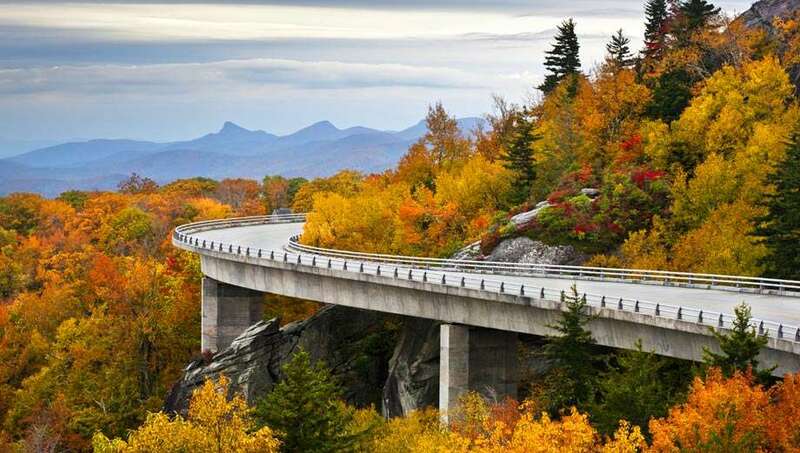 The road itself is 469 miles of gorgeousness weaving from Shenandoah National Park in Virginia, along the Blue Ridge Mountains themselves for most of that trip to Asheville, with a westward detour through the Black Mountains, the Craggies, and clear on to the Great Smokey Mountains. Vast as the official road is—dipping down into the 1500s and back up to elevations around 6000′ while winding through multiple mountain ranges—the heart of it is here in Asheville though, where the road takes an easy pace, offers the kinds of slithering turns typically reserved for motorcycle commercials, and opens up to layer after slightly purpler layer of distant mountain peak vistas. The Blue Ridge Parkway is everything we look for in a good road: beautiful scenery, absolutely no chain stores, billboards or signage of any kind (other than government road signs), and best of all, anyone else on the road with you is in absolutely no hurry. You never feel like you’re going too slow, taking too much time to soak in the scenery, or generally just being “a tourist”, because there’s really no reason whatsoever to be on the Parkway other than to purely and simply “be” on the Parkway. A couple is perched cliffside, their black Pathfinder with Oregon license plates a quarter mile down the road behind them, looking down over a valley on the Parkway still north of the East Asheville exit. She’s wearing a mustard dress with dark brown leather boots and a checkered vest, herself looking like she was born to live in these woods in this season, as if the forest had convened and agreed to orchestra up into it’s end of year colors just to match her ensemble. Her boyfriend was attempting to take photographs of the valley below, of his girlfriend with the trees around her, but as much fun as it might be to try, it’s no use; this is just one of those things that can never seem to be truly captured correctly with a little digital camera. Part of the whole thing that’s happening here is the vastness, the panorama of it all, how every little background color, all of the whistling birds and high winds and passing cars come together symphonic and as the sun shines down into your eyes and over your cheeks, it all just works. The Parkway rounds this bout after the next, up and down and sometimes completely in the canopy of the forest woven from the bows of red spruce and Frasier firs, many trees which only grow in this part of the world. After the last Ice Age thawed out in this region, the hardy cold temperature trees that dominated the landscape of the Appalachian Mountains at the time began to give way to more temperate varieties, except for these few spots along and around the Parkway that are 5500′ or higher. For flora enthusiasts, it’s like a trip back in time to see a now practically extinct group of species, for the average automobile driver, it’s the background of their very own car commercial. 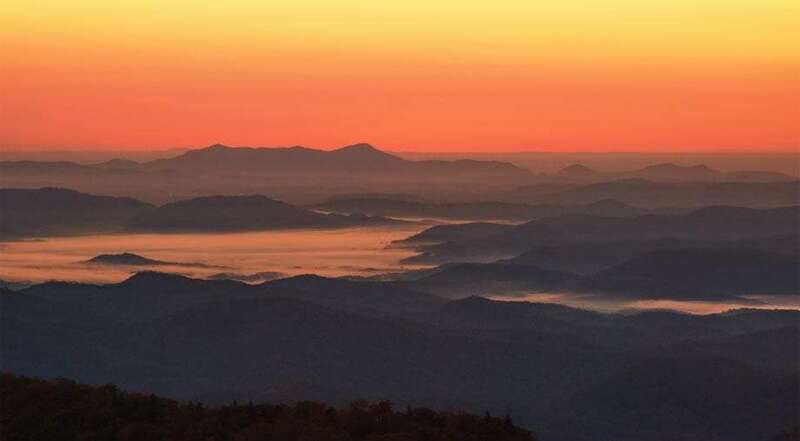 Few roads in this country offer, mile for mile, the cliffside verandas, surprises around every corner, shifting gears, turn hugging experience that is the Blue Ridge Parkway. If part of what traveling is about to you is the take it all in and just be in the moments living that a fresh, gorgeous landscape can perfectly provide, the Parkway is a definite box you’ll want to check off of your list. Sunrise near Black Balsam, south east of Asheville on the Blue Ridge Parkway. 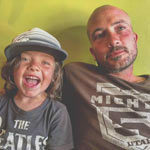 Photograph by Matthew “ArmyJacket”. A young couple gets out of their car, followed by what appears to be their son and his grandfather. Dad’s wearing a backpack and the boy opens a bottle of water, chugging it down as they all move into the forest for whatever hiking or birdwatching or picnicking escapade they’ve come here to endeavor. This is somehow happening everywhere, at every pull off available, but never feels crowded. There’s enough space up here for anyone looking to take a few minutes and dodge the arrow fast and dangerous freeways down over the mountainsides. We follow a trail that winds a short way up over a hill, the cliff face dropping drastically at the end of the trail, a hillside covered in briars and brambles, likely full of blackberries when the season’s right. We’re rewarded for our short galavant up and over hillside with a sweeping view of what feels like more than just North Carolina. The Biltmore Estate can be seen in the distance, along with a far away factory and other minor signs of civilization barely discernable from our vantage point. The Sun behind us, not quite ready to set but clearly giving it some serious thought, has cast it’s late afternoon hue across the mountains, and layer after layer—I can count at least seven—of competing ridges are all cast in purple as the lighting and distance slowly drown out their colors. I can only assume this is what they’re talking about when they sing of America’s Purple Mountains’ Majesty.